Extra Safe Life Vest Includes A Two-Way Radio | OhGizmo! By Andrew Liszewski on 04/11/07 • Leave a comment! Not only is this life vest approved as a personal flotation device by the U.S. Coast Guard but it also has a special pocket for holding one of two included 14-channel, two-way radios. That way the radio remains easily accessible in the event of an emergency without being a nuisance the rest of the time. The special pocket also has an easy to open zipper closure for rapid removal. 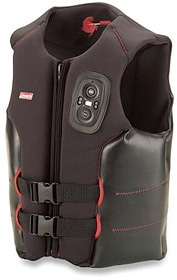 The exterior of the vest is made from neoprene like a wetsuit while the interior is filled with 100% PVC foam that is segmented and beveled for ease of maneuverability. The included radios are waterproof up to 3 feet and have a range of about 1.8 miles. They each have a large, easy to use talk button and run on 3 AAA batteries. The Two-Way Radio Life Vest is available from Hammacher Schlemmer for $129.95.